If you want to create a professional gallery, then Envira gallery is for you. It is used to create beautiful photo and video galleries that is responsive. The plugin is easy to use and is powerful enough to build any gallery. Not only that, it comes with a drag and drop builder so that you don’t have to write a single line of code. By using it, you can create galleries with few clicks. 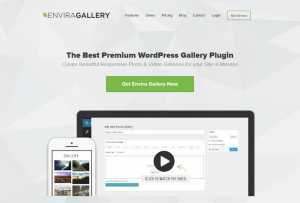 Envira gallery plugin comes with pre-built templates so that you don’t have to start from scratch. Other than that, it is completely responsive and also supports eCommerce store. By using the plugin, you are cutting down the time to build a gallery from hours to minutes. It also becomes easy to share images and content that you care in a matter of minutes and make it viral through social media support. It is best suited for business who deal heavily with gallery based content such as images and videos. A video streaming site, for example, has a perfect use for it. Simple blogs can also use it to highlight their top content. Moreover, it is best suited for photographers to showcase their work. Galleries are part of any website which makes Envira Gallery a lucrative plugin to have. Support is provided through ticketing system and form submission.